DREAM ENGINE Co., Ltd. who develops, produces, and sells next-generation battery (Head Quarters: Chiyoda-ku, Tokyo-to, president: Kazuhiro TADOKORO) will start the mass production of breakthrough magnesium air battery “enerseed®” whose convenience is considerably improved from end of September 2018 after obtaining the applied technological patent and registration of trademark on January 21, 2018 and February 9, 2018, respectively. The magnesium air battery receives attention as an environment-friendly next-generation battery which generates electricity by reacting magnesium with water and air from zero. As much magnesium is contained in marine water, the safety level is high for human body and environment and this product is disposable as general combustible waste. It is free from care of resource depletion unlike rare metal, lithium and it can be procured inexpensively. Moreover, there is a large merit; the power generation efficiency per volume is twelvefold of that of manganese (general dry cell). On the other hand, the existing magnesium air battery has various issues; “salt is required for power generation”, “electric power is weak and unstable immediately after the power generation is started “, “mass production is difficult because a lot of batteries are implanted in products”, “body is large and expensive”, “internal electric resistance is large and generates heat”, “thermal expansion is frequently caused”. 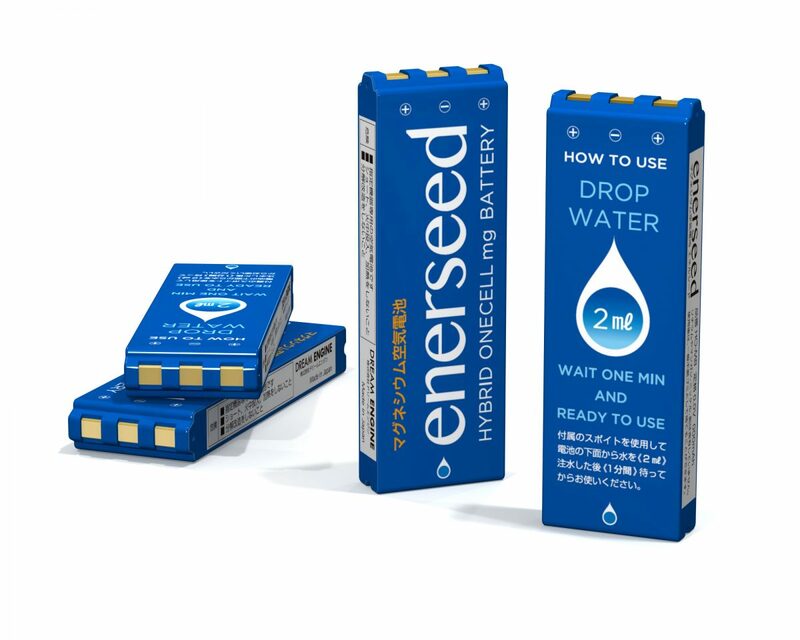 “enerseed®” autonomously starts power generation only with a few drops of liquid including moisture (bath water, juice, or coffee etc.) in addition to water without using salt. Moreover, stable supply of rated power is enabled in one minute after the start of power generation. As this product is usable in one minute after putting water, it can be called “instant battery”. Moreover, monthly 50,000 to 200,000 pieces of mass production is enabled by making the battery in a size of two pieces of stick gum and converting it into a commercial reality as “battery” and considerably reasonable supply at comparatively low price 500 yen is realized. The weight is light; 12g. It is the world’s lightest weight (*) as a magnesium air battery with equivalent performance. As the internal electric resistance is considerably decreased by “HYBRID ONECELL (hybrid cell)” technology taking advantage of multiple patent technologies which have obtained by repeating the improvement, the output fluctuation of electric power gets stabilized. It has realized continuous supply of stable electric power at 1.1V and 15mA. Moreover, the heat is rarely generated and the thermal expansion is not caused because the energy loss is dramatically cut. Additionally, power generation efficiency is increased and the continuous generating time is increased to about two-and-a-half times of that of alkaline manganese battery. This is an innovative battery which defies the existing common sense of magnesium air battery. Moreover, the recommended expiration date in unpacked status is triple to quintuple of that of alkaline manganese battery and the long-term storage is available. Thus, this product is suitable for securement of electric power in various fields such as outdoor amusement, leisure, hobby products like toys, disaster prevention stock for flood disaster etc., and products related to human life for marine accident / mountain rescue, medical treatment etc. in addition to electronic equipment for everyday use. DREAM ENGINE plans to develop various products in cooperation with major manufactures in wide range of genre and promotes sales in Japan and overseas in cooperation with multiple major trading conglomerates in future. 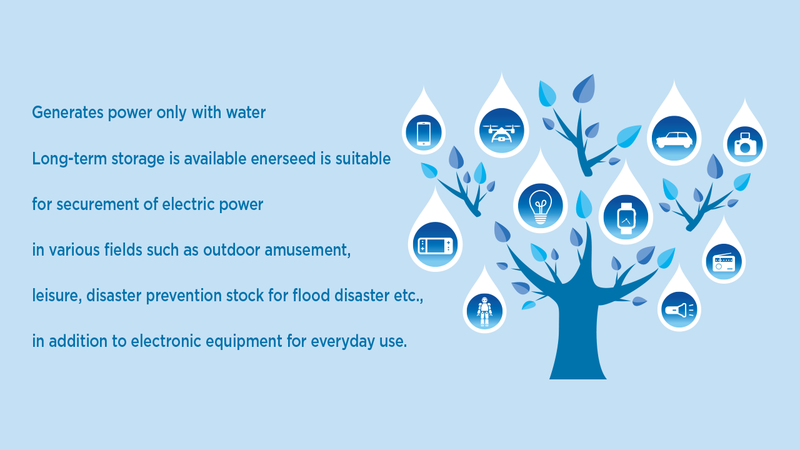 Especially for sales overseas, the moving into south-eastern Asia where the electricity supply is unstable and flood disaster frequently occurs is planned.